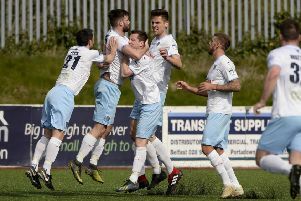 On-loan St Johnstone defender Gareth Rodger scored a last-gasp equaliser for Ballymena United in a game which saw both sides reduced to 10 men. The match sparked into life on 34 minutes when Michael Ruddy and Shane McCabe were sent-off by referee Evan Boyce after an ugly clash. Michael McCrudden fired in the opener on 68 minutes after meeting a Liam Martin cross. Ruddy was shown a red card for an ‘over the top’ tackle on McCabe and the midfielder followed the full-back to the dressing room when he appeared to kick out at Ruddy. McCrudden’s third goal of the season nudged the Fermanagh side in front. Matthew Shevlin, Cushley and Eoin Kane were denied by Rouse and Cushley also hit the bar, before Rodger eventually made the late pressure pay with 93 minutes on the clock.